This Indianapolis food tour explores the commercial corridor bordering two of the earliest and most historic neighborhoods, Lockerbie and Chatham Arch. Massachusetts Avenue is a prominent commercial boulevard crossing a grid of residential, commercial and industrial buildings that developed mainly throughout the 19th century. The area is also home to an expanding food scene, hosting nearly two dozen locally owned restaurants. The restaurants throughout the area are a combination of long standing local favorites dating back to the 1800's and new hot spots embracing the culinary traditions of the area. The Massachusetts Avenue Food Tour will explore the advancement of Indianapolis cuisine over the past 150 years; from the traditions brought over by the city's original immigrants, to locally sourced progressive cuisine, all within a beautifully restored neighborhood. 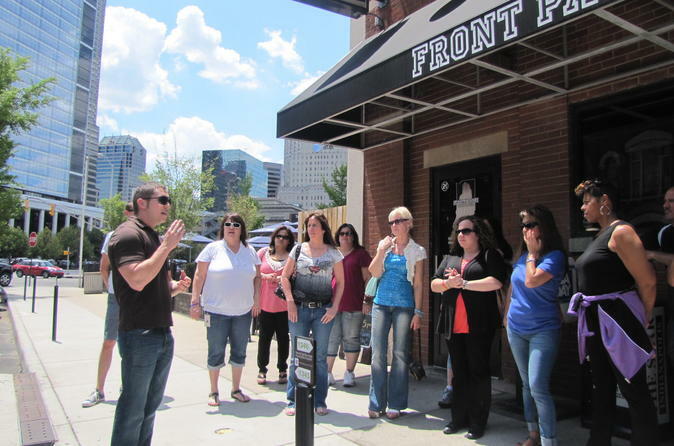 This Indianapolis food tour explores the commercial corridor bordering two of the earliest and most historic neighborhoods, Lockerbie and Chatham Arch. Massachusetts Avenue is a prominent commercial boulevard crossing a grid of residential, commercial and industrial buildings that developed mainly throughout the 19th century. The area is also home to an expanding food scene, hosting nearly two dozen locally owned restaurants. The restaurants throughout the area are a combination of long standing local favorites dating back to the 1800's and new hot spots embracing the culinary traditions of the area. This food Tour is a walking activity for smaller groups, although private and custom tours are available upon request. We can alter menus to accommodate for nearly any dietary restriction, as long as we are given advance notice. Although the tours are walking, they are meant for people of most activity levels, and cover roughly a mile within the 3 hour time frame.